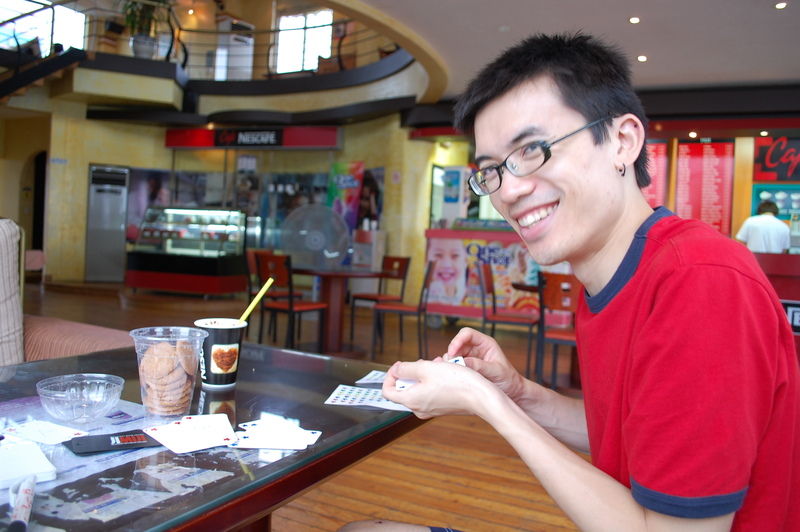 About a month before Jeff and I left Korea for Mongolia we had three days plus the weekend to take a mini vacation. We originally thought about going to Japan, then considered the Philippines, but both of those trips seemed too expensive and we felt that we wouldn’t have enough time to actually enjoy our jaunts to these other countries. After much thought and talking with others, we decided to stay in Korea and travel to the east coast to the city of Sokcho for a four day vacation by the beautiful beach and the famous Sorak mountains. The week before our trip I kept checking the weather forecast, rain. Despite the threat (okay, it was like 78% chance or something crazily high like that) of rain, we decided that we needed to get out of Seoul, even if our trip was threatened by rain. My co-teacher booked us bus tickets and on Saturday morning we made our way to the Express Bus terminal and boarded the bus for our four hour trip “out east”. We had no hotel booked and just had two things on the agenda – go to the beach, and climb the mountain. 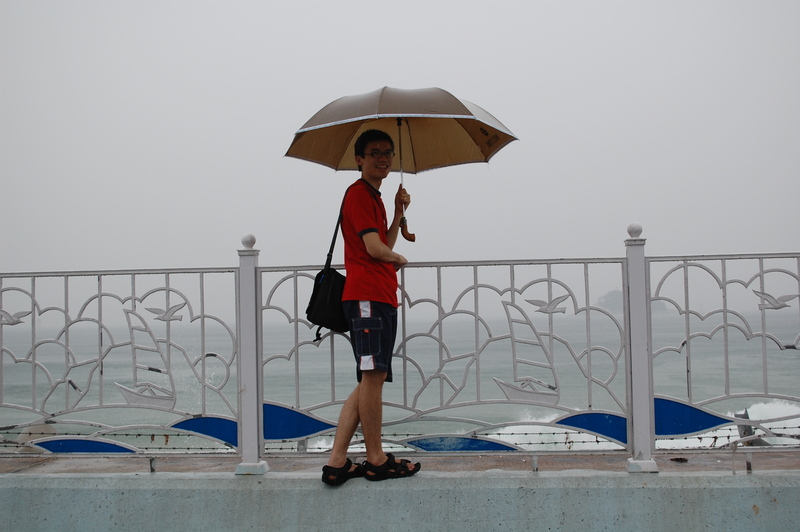 It rained the whole way to Sokcho, but I still had high hopes that the rain would subside and that we would be blessed with beautiful weather – but alas, it was not to be! Jeff and his umbrella – a constant compainion during our trip. We got off the bus and wandered around the small town in the rain (with no fear of being pushed by the old grandmas, and no worries of being hit by cars as we crossed the mostly empty streets – it was paradise!) looking for a place to stay. We decided upon the Black Box love motel. Let me tell you, this place was awesome! 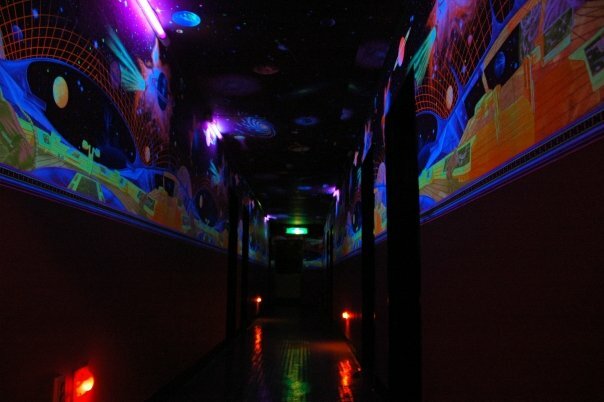 The upstairs hallway at night. 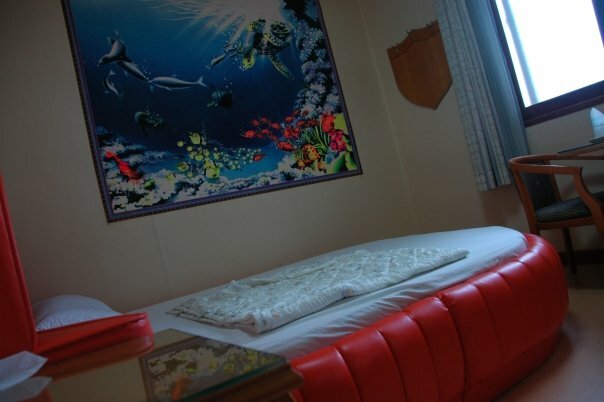 Our orange pleather bed with velvet “painting” and black light. After checking in we wandered along the beach for a bit and ended up sitting in a cafe – it was just too dreary a day! 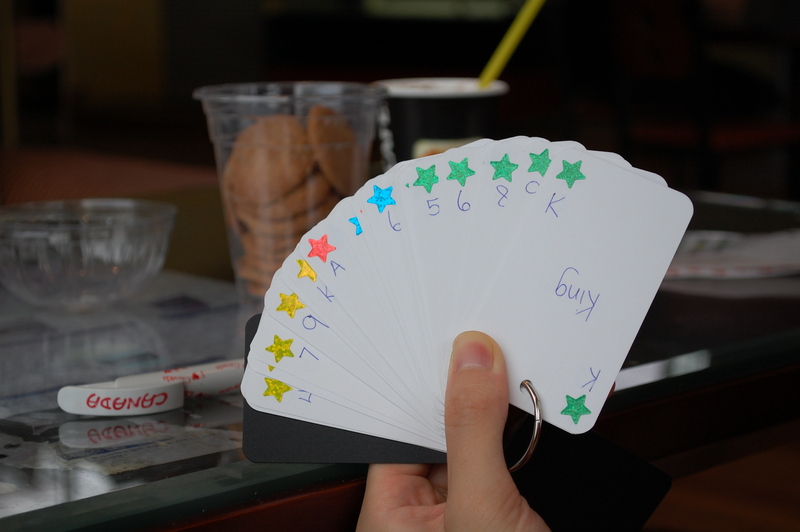 Well, luckily we’re both big dorks so we decided that the perfect way to spend the first day of our holiday would be to make some playing cards since we had forgotten to bring our own and we couldn’t find any in Sokcho. 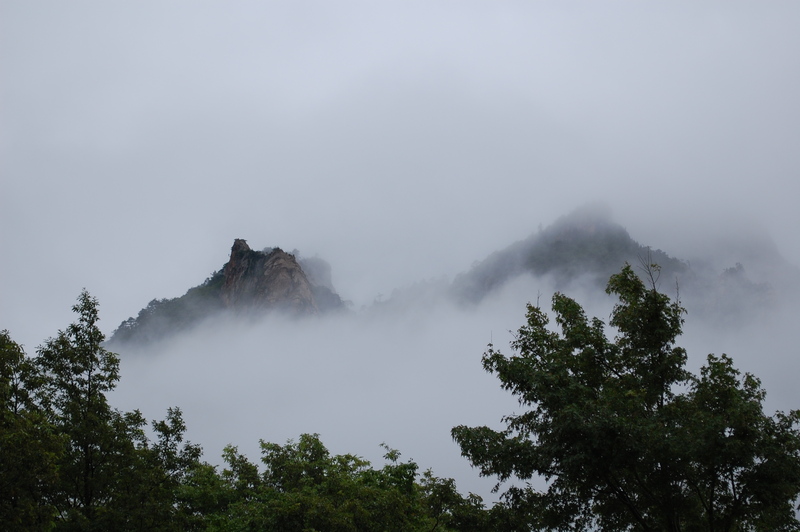 The next day we jumped on a city bus and took the 30 minute trek to Soraksan (the mountain) to see if we could see anything. The sky was covered with clouds and it threatened to rain our whole trip there. Although we didn’t get to see much, what we did see was beautiful! Twin peaks peeking out from the clouds. 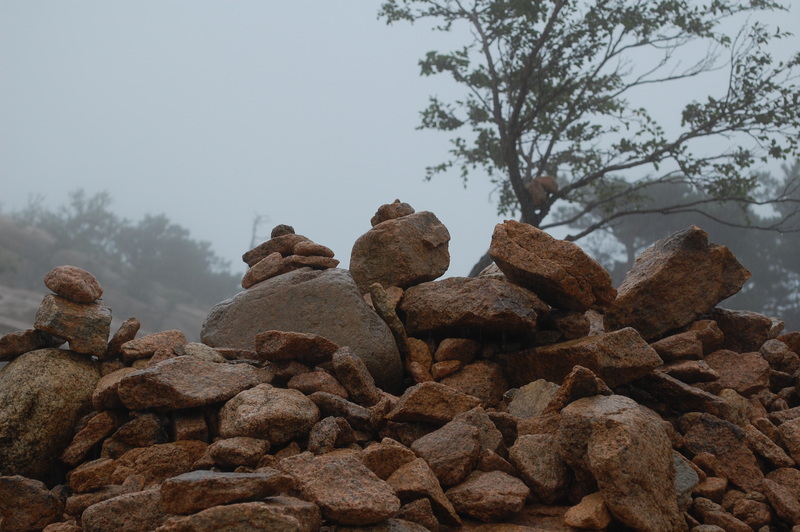 Rock piles at one of the mountain peaks. We couldn’t see anything below us because of the fog! 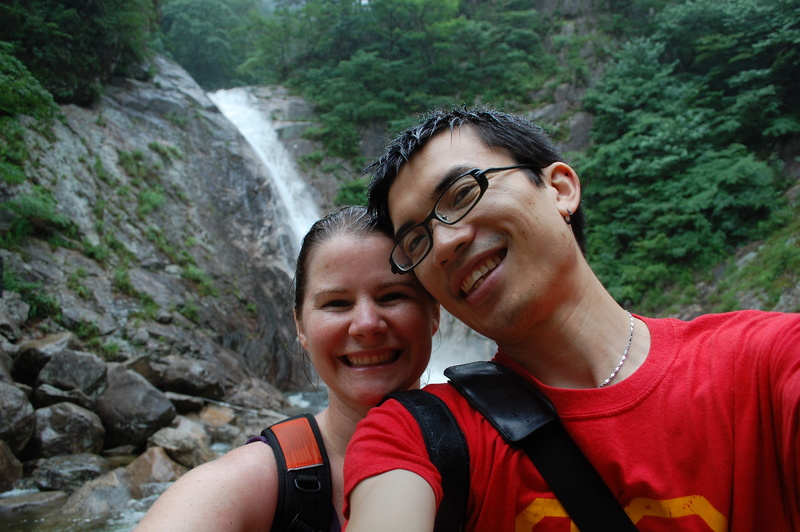 We hiked up to a waterfall and ended up enjoying a wonderful lunch with a Korean born man who is now living and working in the US. He was so kind and wonderful! And so, after two days away from the big city we decided that the rain had gotten the best of us and that it was time to head home. We jumped on the bus and rode for four hours until we reached Seoul. We jumped on the subway and rode another hour until we reached our stop. Weary and extremely wet we made our way home and spent the rest of our mini vacation in our apartment! ~ by dawseng on September 18, 2008.